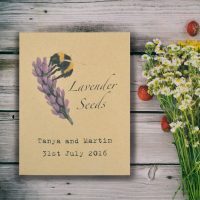 Categories: Unusual & Unique Wedding Favours, Seed Paper Wedding Favours. These personalised seed paper wedding favours are made from quality thick plantable card, which is itself made from recycled paper. They are such a great idea as a gift for your guests to take home – and useful and long-lasting too! Each seed paper card is white, A6 in size and liberally scattered with seeds that really will germinate and grow into flowers! Paper thickness is around 150 gsm. Check out the photos below of some paper we planted germinating and flowering. The paper contains the following flower seeds: Catchfly, Daisy, Poppy, Spurred Snapdragon, Sweet Alyssum and Black-eyed Susan. 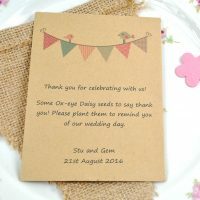 This seed paper wedding favour is personalised with your wedding details, and planting instructions are at the bottom – please advise us of your personalisation details below. 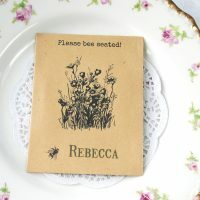 You will receive a pack of 10 personalised seed paper wedding favours. Seed paper is very easy to grow. Spring and summer are the best times to plant it so that you have the benefit of the flowers prettifying your patio or balcony in summer! 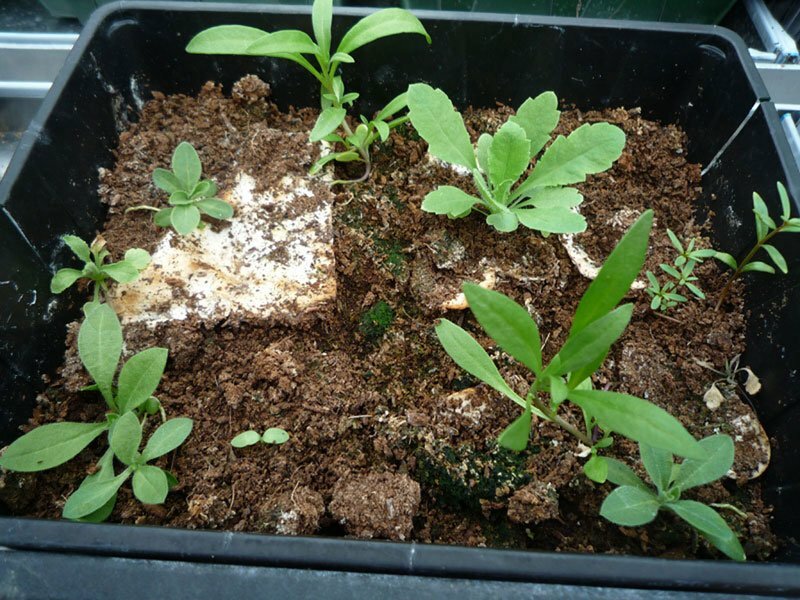 Simply place the paper in a pot or tray of compost (preferably peat-free!) and water well. Place somewhere warm and light to germinate and keep moist. 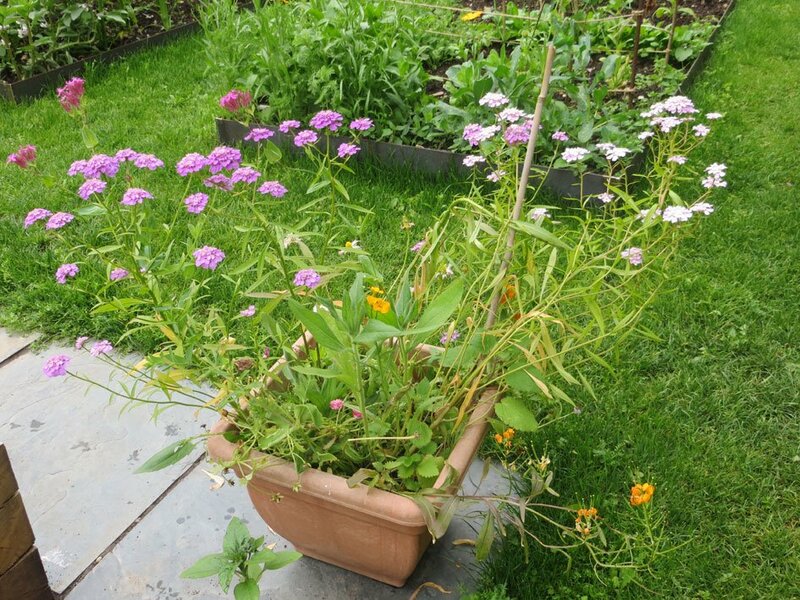 Once seedlings are big enough to handle, transplant into a big pot and place outside in a sunny spot. We do not recommend planting the paper directly into the garden as there is the risk of slugs and mice eating the seeds/seedlings. Vital to success is not letting the paper dry out inbetween waterings! A card with planting instructions will be included with your order. 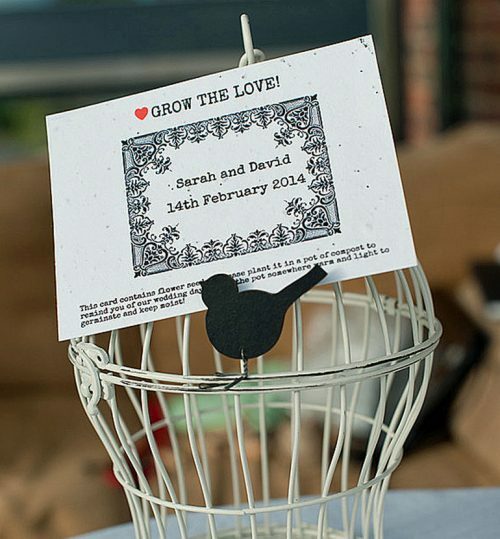 We think you will agree this is a truly marvellous wedding favour and also a bit unusual. A perfect reminder of your wedding day and butterflies and bees will thank you for the flowers!